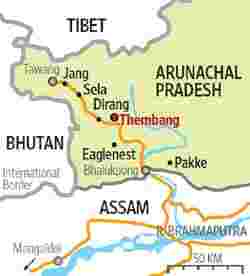 Thembang / West Kameng/Arunachal Pradesh: A tall, fortified stone wall greeted us as we drove up a steep hillside on western Arunachal Pradesh that led to the Monpa settlement in Thembang. 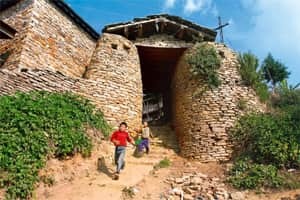 Just like the Gallic villages in the Asterix comics, the village of Thembang has two stone gates as its entry and exit points, one facing the south and the other the north, the distance between them covering around 50 metres. We were in an 18th century village citadel. This was a moment of deja vu. Tucked away in a remote corner in western Arunachal Pradesh, this little village is perched on a hilltop at an elevation of 2,300 metres. It looked like the entire place was trapped in a time warp. But the satellite discs, mushrooming from the old wood and stone houses, snapped us out of our reverie. “Earlier, there was no regulation to control hunting and felling of trees, until the villagers woke up to dry springs, decreasing rainfall and a warmer summer every year," says Wang Tsering Dirkhipa, the village headman, locally known as the gaon bura. He calls on Pema Wange, a suave young local, to show us around the place. The lamas, or the monks, were conducting prayers to the rain god at Wange’s stone house—an elaborate three-day ceremony to appease the Almighty for a good shower. “The crisis over rainfall indicates the hazards of toying with the environment. It has become so warm that we need fans in the village and insect-inflicted diseases have increased," laments Dirkhipa. As a wake-up call, the villagers formed the Thembang Bapu Community Conserved Area (TBCCA) management committee with the help of WWF-India, a nature conservation organization. The village panchayat endorsed this initiative for the cause of nature conservation and socio-economic development of the forest-dependent tribal population. The TBCCA management committee’s basic plan was to divide the community land into two broad zones—a core zone for complete protection of the forest and the wildlife, and a buffer zone for sustainable utilization of available natural resources by the villagers. A strict ban on hunting and harvesting of trees, shrubs and herbs has been implemented. “Direct and active involvement of local communities for the conservation of the biologically rich forest is a must and this can only be promoted by economic incentives. Based on an analysis of potential livelihood options, community-based tourism (CBT) was considered to be the most viable option. This could provide high economic returns, thereby driving conservation," adds Dutta. Wange is also a member of the WWF-India team and works for their community-based conservation initiatives. He leads us to one of the five operational homestays in the village. The homestay programme is a tourism initiative that allows local families to rent out rooms to tourists for a period of time. This is a part of the community-based tourism project that was found to be a viable option for the villagers by the TBCCA management. Surprisingly, our homestay had a large furnished room with an equally spacious balcony overlooking the village. The home-cooked meal was simple and delicious, a far cry from the dingy, over-priced hotels in the neighbouring towns of Bomdilla and Dirang. Here at the homestay, we interacted with the members of the household and picked up useful information on the surrounding area. Wange took us for a quick drive around tiny patches of corn fields around the village wall. In this faraway land, life is laid-back and people lead a simple pastoral life. The ancient barter system continues and people trade corn for daily necessities. As we took a brisk walk across the village, we came across traditional wood carvings, paintings and manuscripts, many of them decades-old, etched as murals and graffiti along the houses and ancient ruins. Remnants of old fortifications, carved stone blocks, mani walls (stone walls with prayers engraved on them) and caves were a testimony to the rich cultural heritage and history of the Monpa tribe. The community-based tourism also encourages home-based restaurants, where traditional lunch is served to visitors and tourists. The TBCCA organizes trekking in the upper reaches of the community forest where the rare red panda, the Himalayan black bear and species of mountain ungulates are found. Tenzin Chopa, another local and a childhood friend of Wange, is gung-ho about promoting his village as a tourist destination. “Years of isolation and idleness have made our people indifferent to nature. It will take time to change their mindset, but there’s a positive response to the benefits of tourism," says Chopa. In the past three years, the total income from the project through CBT has shown an increase, thereby providing a viable source of additional income for the villagers as well as generating a corpus for the TBCCA management committee. Last season the villagers earned around ₹ 8 lakh from tourism-based projects and contributed a corpus of ₹ 2 lakh to the committee, which will go towards patrolling and monitoring of the community forest. More surveys are being conducted to identify critical wildlife areas. Progress has been slow but positive in the last couple of years. But the Monpas believe they can win the conservation battle.